Sure, everybody gravitates towards eggnog and mulled wine for the holidays. But how about celebrating Christmas with holiday drinks like a Peppermint White Russian or a Hot Gin Punch? 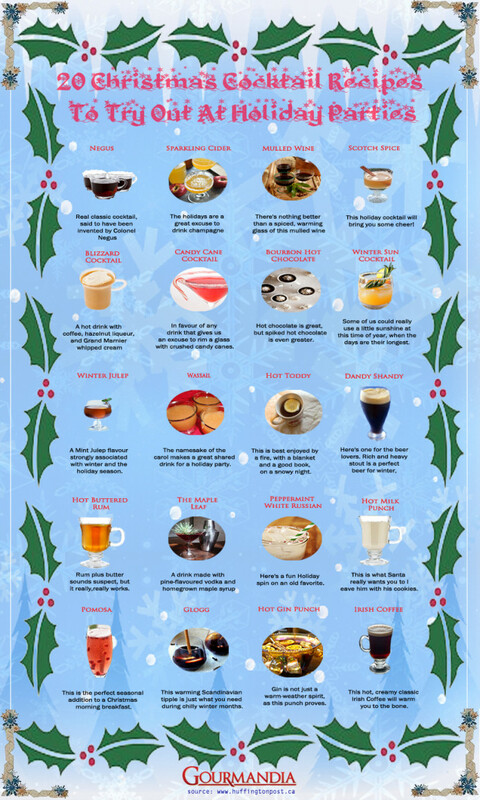 These are just two of the 20 Christmas cocktails you'll find in this infographic from the folks at Gourmandia. There's plenty to choose from for everyone attending your holiday party, from bourbon-laced hot chocolate to the classic hot buttered rum. Aside from well known cocktails, the infographic offers more obscure holiday drinks like the Maple Leaf, which is made from pine-flavored vodka and homegrown maple syrup. Check out the full list below. Bottoms up!